With all eyes on Secretary of State Hillary Clinton’s long awaited and highly anticipated testimony today on the September 11, 2012 terrorist attack in Benghazi where Ambassador Christopher Stevens, information management officer Sean Smith, former Navy SEALs Tyrone Woods and Glen Doherty, were murdered, the stonewall continues, and more chilling signs of a cover-up emerge—this time from Freedom of Information Act Requests (FOIA) to the CIA. As the New York Times reported, Woods and Doherty worked under contract with the CIA. Recall how officials briefed on intelligence told the Wall Street Journal: “The U.S. effort in Benghazi was at its heart a CIA operation,” and the State Department presence in Benghazi “provided diplomatic cover” to conceal weapon transfers from Libya to Syria. In addition, as Aaron Klein of kleinonline.com reported, “The U.S. diplomatic mission in Benghazi, Libya, actually served as a meeting place to coordinate aid for the rebel-led insurgencies in the Middle East, according to Middle Eastern security officials … Among the tasks performed inside the building was collaborating with Arab countries on the recruitment of fighters – including jihadists – to target Bashar al-Assad’s regime in Syria.” The so-called Benghazi mission or consulate as the Obama-Clinton regime described it to be was in reality a CIA outpost. 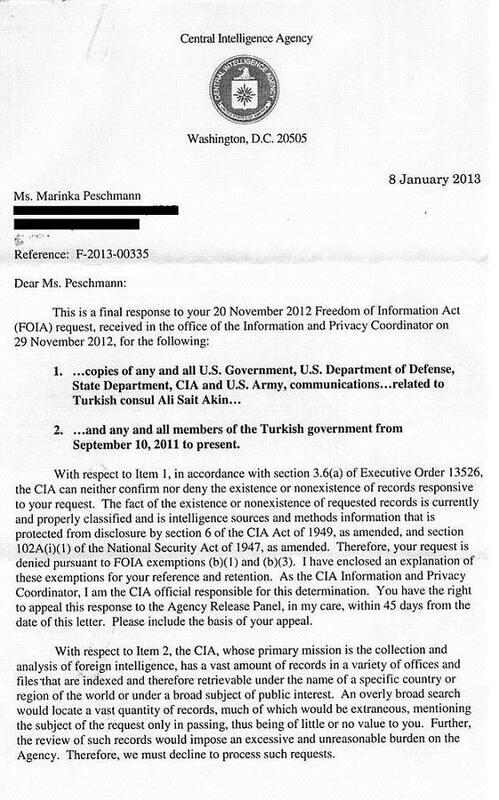 Now, the Central Intelligence Agency (CIA) declined my CIA FOIA request seeking information in regards to Ambassador Christopher Stevens and Turkish Consul General Ali Sait Akin and “any and all members of the Turkish government …” Akin was the last known person to have met with Ambassador Stevens. Their meeting concluded about one hour before the deadly attack on September 11 began at approximately 9:35 p.m. local time. 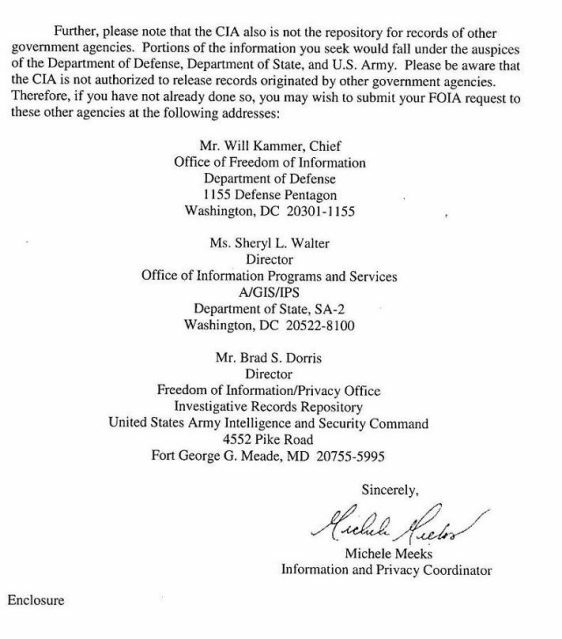 As CIA Information and Privacy Coordinator Michele Meeks wrote: “With respect to Item 1, in accordance with section 3.6(a) of Executive Order 13526, the CIA can neither confirm nor deny the existence or nonexistence of records responsive to your request. The fact of the existence or nonexistence of requested records is currently and properly classified and is intelligence sources and methods information that is protected from disclosure by section 6 of the CIA Act of 1949, as amended, and section 102A(i)(1) of the National Security Act of 1947, as amended. 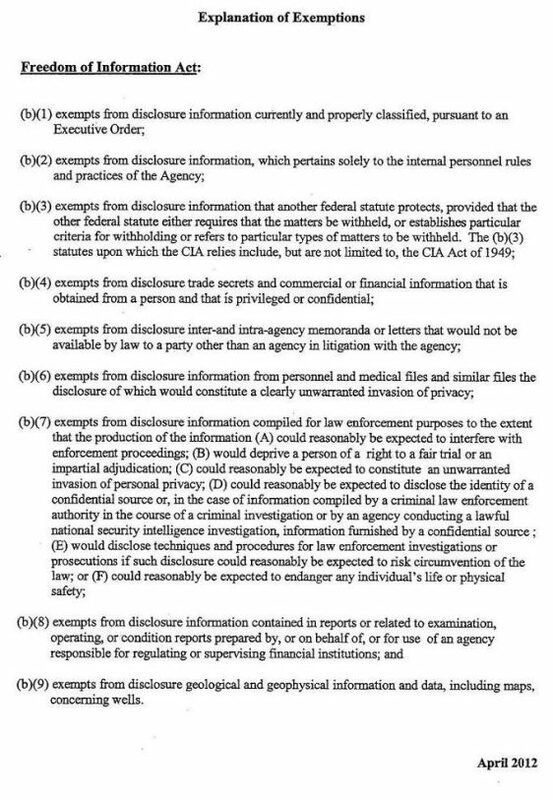 Therefore, your request is denied pursuant to FOIA exemptions (b)(1) and (b)(3). Last November former CIA Director David Petraeus (unlike President Bill Clinton) suddenly resigned after news of his tawdry affair with biographer Paula Broadwell broke worldwide. Broadwell had reportedly been sending threatening type emails to a Florida socialite Jill Kelley. Meanwhile as reported in The Fix is in Series, Hillary’s Benghazi Advisory Review Board Report (ARB), chaired by Ambassador Thomas R. Pickering and Admiral Michael Mullen as Vice Chairman, did not bother to mention Turkish Consul General Ali Sait Akin. Instead as previously reported Hillary’s Benghazi ARB blamed Ambassador Stevens, when Ambassador Stevens was likely following orders. As I’ve been reporting, the Obama-Clinton regime has been using the same play book the Clinton White House (with co-president Hillary) used to successfully cover-up of the death of Vince Foster, as documented in Following Orders: The Death of Vince Foster, Clinton White House Lawyer. What you will witness when Hillary testifies will be a whitewash with Hillary, thanks to Senator John Kerry, already recast as the hero for “swiftly” implementing the ARB’s recommendations. To see how the Benghazi cover-up will play out read Benghazi Cover-up 101 for Dummies. To see how Hillary dodged indictments during the Clinton era, click here.